I love to garden. The dirt is my canvas and my paint includes vegetables and flowers. But I didn’t always love it. Growing up, the garden meant eternal hours, (at least it seemed that way) shucking corn, picking beans, pulling weeds, and hauling water. And then the canning and freezing! Oh glum and despair on me, (again it felt that way to me). I hated sweating in the hot, steaming kitchen cleaning beans, bagging corn, peeling fruit, and mashing tomatos. I’d rather be out playing. My Mom and Grandmother canned and froze anything they could get their hands on. Of course I enjoyed the fruit of our labors. I took it for granted then. 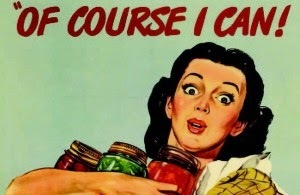 Canning? No it wasn’t even on my radar. Not until five years ago when I just got sick of what passed as lame, sad excuses of produce in the supermarkets. So I ventured into the new world of canning. It was kind of intimidating, but you know, I just dove in and was pleasantly surprised at the results. Thankfully no disasters and no explosions. Only hurt pride when my envisioned Vlasic style pickles turned out limp as a noodle. I’ve canned tomatos, peaches, and salsa. All very good. Also freezed green beans and blueberries. Again, wonderful and fresh. Nothing like eating the fruit of your labors in the middle of winter. Yes, it is work, don’t let me fool you. But wow, it is so worth it! Anyway if this has been on your radar, and you are a bit intimidated... well let me be the one to cheer you on! Go for it! If this girl can do it, you can too. There are plenty of online helps to guide you. Here’s the Ball guide: http://www.freshpreserving.com/getting-started. It is very helpful. Walmart carries canning stuff. If you are lucky to have a farm store, (I have a Big R) they are a great source. Do you can and freeze? If so, what success have you had? Any epic disasters?